Kardinal is a humanistic sans serif type family. The family has 32 weights, ranging from Thin to Black with extra drawn italics and small caps versions. The Kardinal type family is ideally suited for small text, books and magazines, branding, posters, as well as web and screen design, headlines and more. 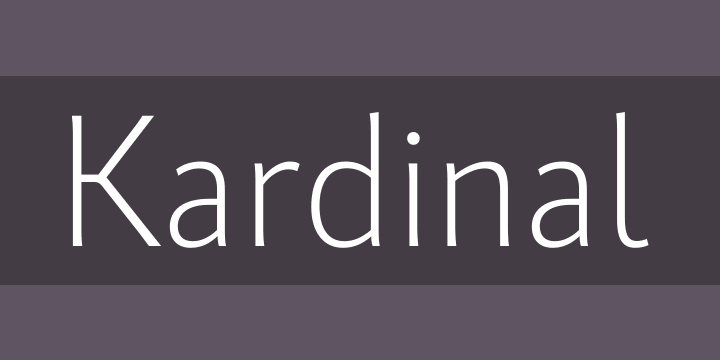 Kardinal comes in 32 styles with extended language support. All weights contain standard ligatures, proportional figures, tabular figures, old style figure, numerals and arrows, matching currency symbols and fraction. The construction of the characters combines clean grotesque style and calligraphic features with humanist fragrance. The small serifs are outstanding for designs. They give the letters movement and freshness, as well as contribute to a better readability in different volume texts and including lots of details that give it a unique personality. The Regular and Medium weights are perfect for body text while the italic give an interesting texture to the text. The range of styles give a good flexibility to this family. The fonts are carefully hinted and perfect for digital use.